Are you the owner of a franchise? If so, then you are probably already aware of just how important advertising is for your business. Franchises are a critical piece of the small business world, and whether you own a restaurant or a rug cleaning service, you are sure to reap the benefits of quality advertising. Small business owners know that the key to a successful business is due, in part, to the quality of its advertising. That being said, a sure-fire way to guarantee that your business receives the attention it deserves is to integrate your branding and advertising with franchise vehicle wraps. At Apple Graphics, we understand that business name recognition and brand identity is critical to your franchise. For example, if you own a rug cleaning service and there are four other rug cleaning companies in your area, then it’s more important than ever to make sure that you have an excellent advertising plan in place. An effective franchise wrap design can help distinguish your brand from those other four competitors. The designers at Apple Graphics can work with you to create a unique design that represents your franchise with both professionalism and individuality. Franchise wraps can make your business go from average to incredible. The installers at Apple Graphics know that if you’re not trying a vehicle wrap for your business, then you’re missing out on an excellent advertising opportunity. 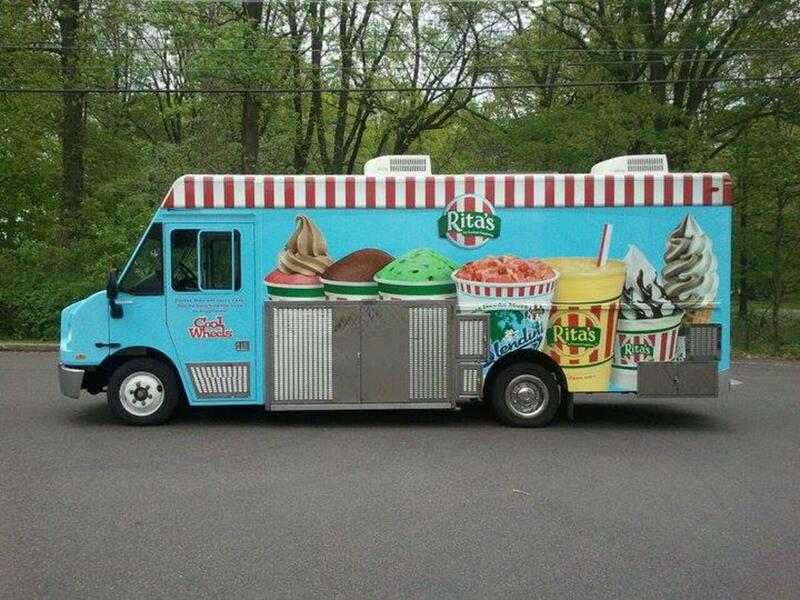 Our recent Rita’s Water Ice franchise wraps were a huge success, and highlight our crew’s ability to franchise owner and you’re only using traditional advertising methods, such as television or newspaper ads, then you’re missing out on a hot new opportunity. In case you’re still on the fence about making the switch from traditional advertising to mobile graphics advertising, consider this: vehicle graphics garner up to 60,000 visual impressions a day. By hiring one of our professional installers to complete the wrap job on your franchise vehicles, you are making the first step toward a more successful advertising strategy. Our skilled installers can help you choose the best design for your franchise, and we can customize your ad to include business specifics such as your website URL, your Facebook page and your telephone number. A professionally designed vehicle wrap for your franchise provides an unequalled return on your marketing investment. Unlike traditional advertising modes that cost exorbitant amounts of money and only last for a fixed time period, advertising with vehicle wraps costs a minimal fee up-front, but generates thousands of views for years to come. At Apple Graphics we understand that vehicle wraps have transformed the way small businesses handle their advertising needs, and we strive to offer our customers the highest quality product.